According to Dr. Joan Borysenko, a woman's life proceeds according to predictable steps: one expects to rear one's children before being faced with the death of one's spouse and subsequent widowhood. However, in ultraconservative Algeria, where armed Islamist radicals during the past decade and a half have incited violence against ordinary citizens, especially women, the standard model of a woman's life does not necessarily apply. Latifa Ben Mansour, expatriate Algérienne, psychoanalyst, and contemporary francophone author, has made the Algerian woman's plight under ultra-right-wing rule the subject of many of her writings. 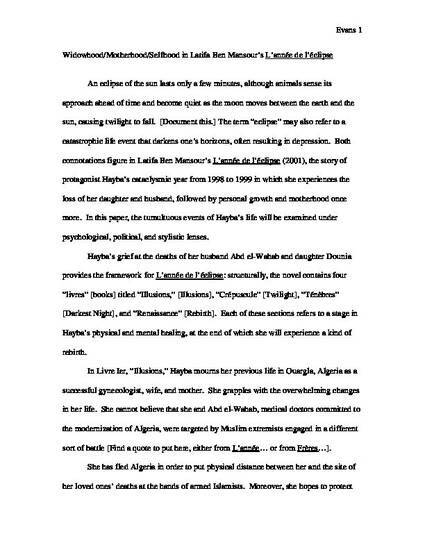 This paper will discuss the themes of her novel, L'année de l'éclipse, through political, psychological, and stylistic lenses.